The next Yokohama Hot Rod Custom Show is over ten months away, but many top-flight builders are already plotting their next entries. 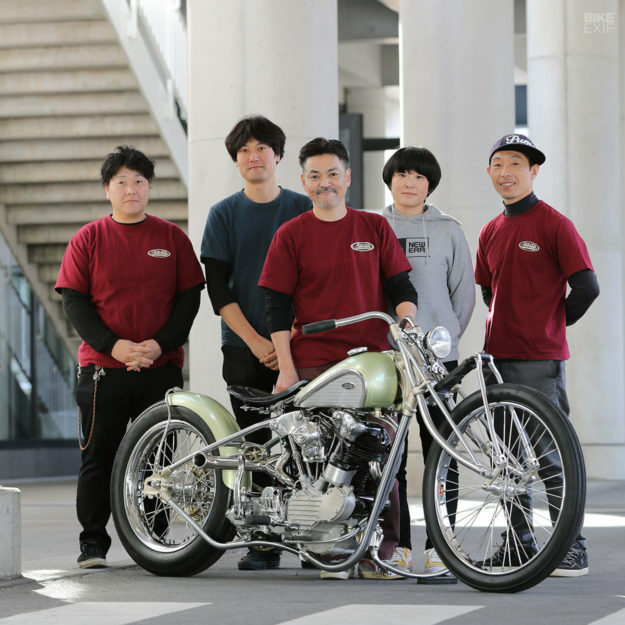 After all, ‘Mooneyes’ is the top custom show in Japan. It’s jam-packed with supreme craftsmanship—so if you’re bringing a bike, it had better be good. 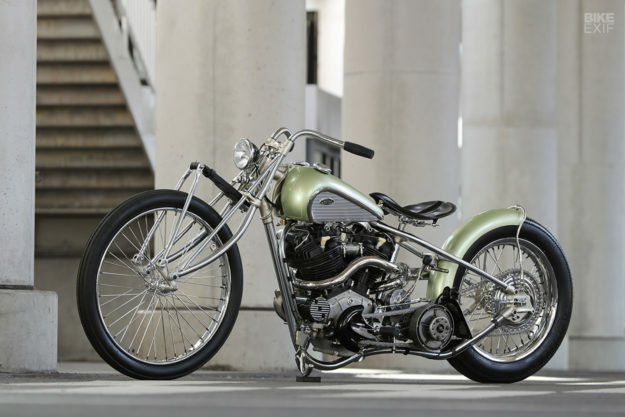 Here’s a closer look at a gem we uncovered at the most recent show: a magnificent hardtail with a knucklehead engine, created by Hideki Hoshikawa and his team at Asterisk Custom Works. Hoshikawa-san built it just for the show, and it took him almost a year. If you’re wondering why it took so long, here’s a clue: We asked Hideki what the donor bike was, and he simply replied, “there is no base bike…we made it from scratch.” That’s right—this is no weekend special. Hideki named the project in honor of the Swedish opera singer Jenny Lind, after watching the film The Greatest Showman. 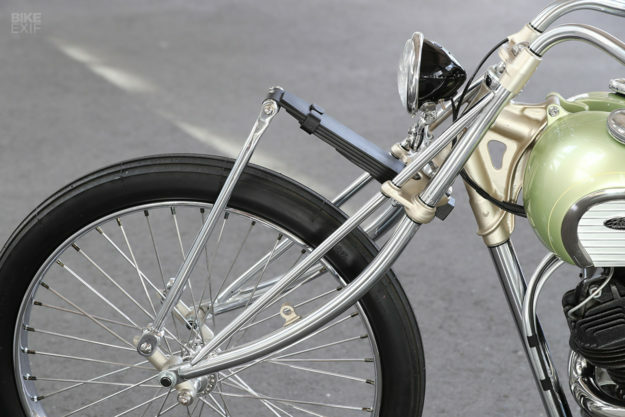 “I tried to recreate the real diva from the movie, in our custom bike,” he explains. 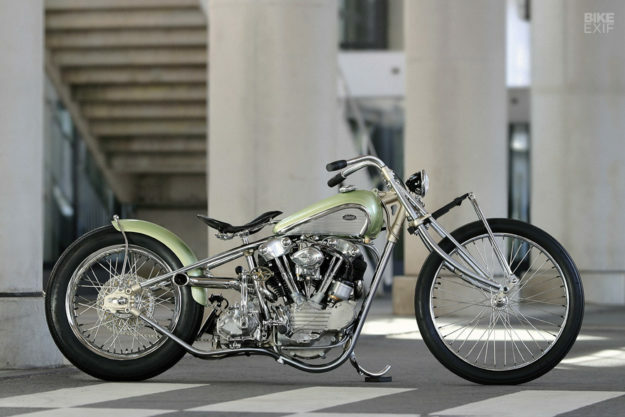 Hideki chose a S&S Cycle Type E Knucklehead motor for the project. He then decided to take the theme further, going full retro on not only the style of the build, but also the techniques. So there’s no fancy CNC work going on here; all the custom bits were hand-made using basic tools. The hardtail frame, for starters, is a one-off. 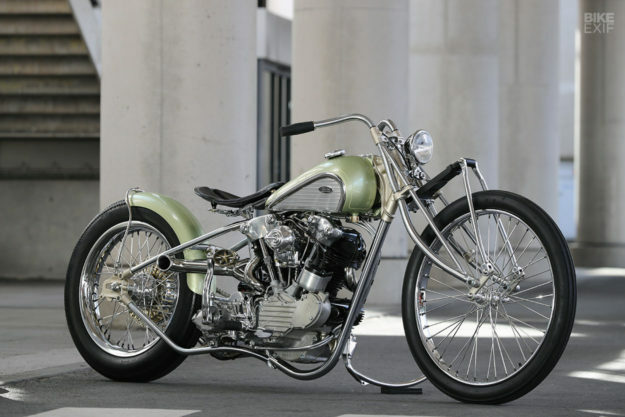 Hideki took the steering neck, seat mount, rear motor mount and transmission mount from a shovelhead frame, but built the rest using chromoly steel. He then had it all chrome plated, before scuffing it up with a Scotch Brite pad. It isn’t a simple design either. Hideki wanted a single down tube design, so he modded the neck to accommodate this. Then he manipulated the down tube with a unique bend at the base, mimicking the shape of the crankcase. That little swoosh is repeated elsewhere too—including the hand-made side stand. 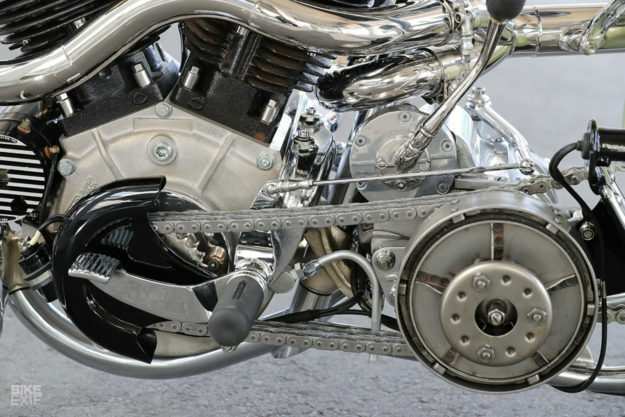 The rear lower frame tubes also follow a definite kink, before joining with a pair of V-Twin manufacturing axle plates. The perfect hardtail stance is equally impressive. The front suspension is a modified leaf spring setup from Cannonball, held in place by triples from Cro Customs. The wheels are a F23/R19, wrapped in Firestone rubber: a Clincher at the front and a Deluxe Champion at the back. 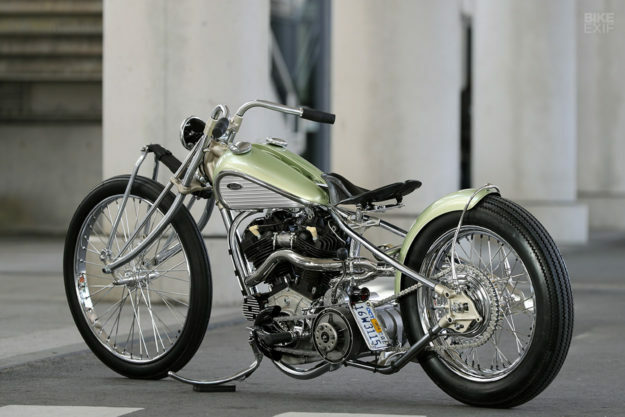 Hideki’s only running one brake; a full KustomTech setup in the rear. He’s also installed a foot clutch and hand shifter, and an internally routed throttle. That’s left the swoopy custom handlebars (and the entire cockpit) super sano. 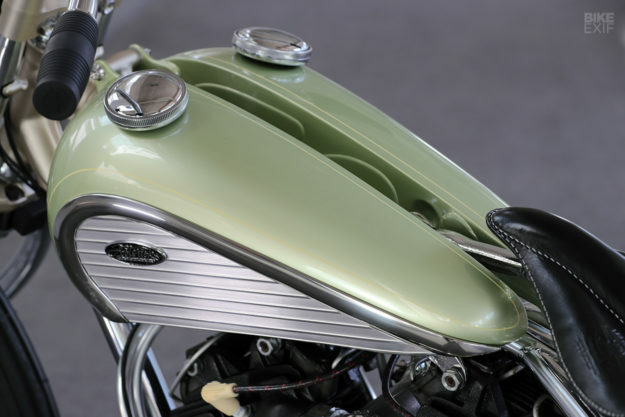 Then there’s that gorgeous fuel tank. It started out as a slightly modified shovelhead unit, but then Hideki decided to add some extra trim. While trawling the web for inspiration, he fell in love with the tail section of the 1957 Chevrolet Bel Air. The initial plan was to just carry some of the Chevy’s trim concepts to the fender, but the idea morphed into a pair of full-on Bel Air style side panels. The paint’s by Yossy; a single hue of green, complemented by a gold pin stripe. Jimmy Dope handled the seat upholstery for the build. 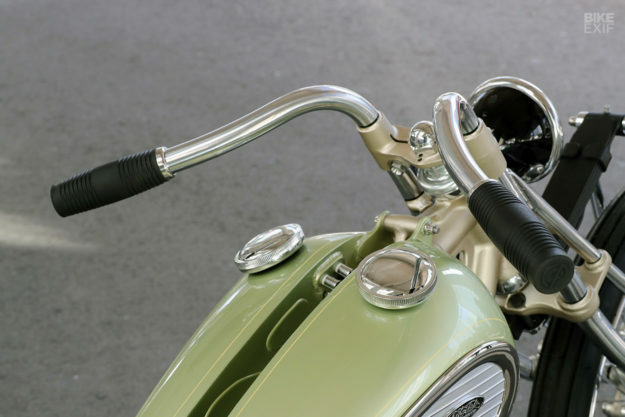 The rear fender’s a modified Russ Wernimont Designs part, mounted on a pair of custom-made stainless steel brackets. 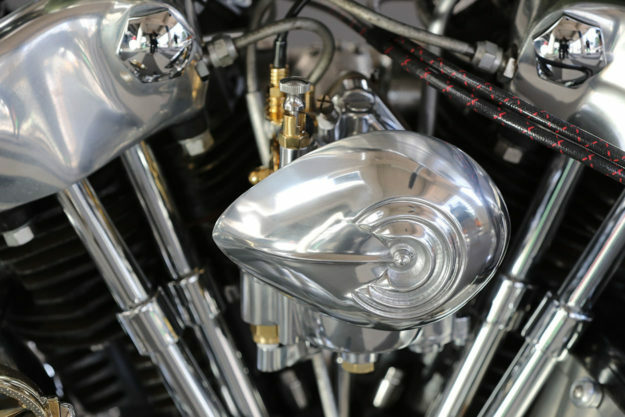 Other custom stainless steel bits include the hand-shifter, carb mount and side stand. The Asterisk crew also fabricated a stubby two-into-one exhaust system, designed to avoid visually obstructing the frame in any way. A sand-cast aluminum air cleaner cover, made by Fork, adds an extra touch of class. With perfect proportions, top finishes and a plethora of neat little details, ‘Jenny Lind’ sure is a showstopper. The bike’s for sale too. Tempted?